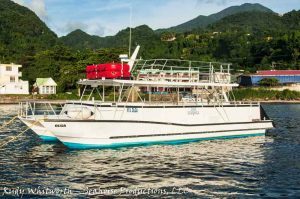 Dive Dominica offers daily boat diving to the Scott’s Head Marine Reserve on one of 3 fully equipped boats. All of our custom built boats are equipped with Oxygen, safety equipment, marine head, dive ladders and offer a partially shaded area. All vessels are registered and carry safety certificates. All boat captains are also licensed. A 47 ft/14 m Power Catamaran that holds up to 24 divers. 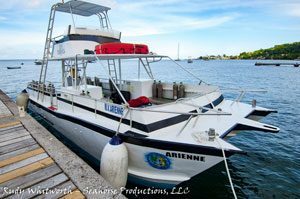 A 36 ft/12 m Power Catamaran that holds up to 20 divers. A 30 ft/10 m Sedan Island Hopper that holds up to 10 divers. Two additional boats provide support for our other activities and charters. The Stingray is a 57 ft/ 17 m power catamaran for up to 96 passengers. 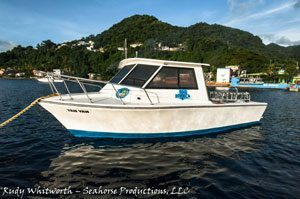 This is a great boat for whale watching and snorkeling trips. There is also the Barana, a 45 ft/ 14 m power catamaran for up to 50 passengers that serves as an all purpose vessel a with glass bottom port. 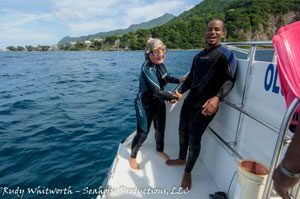 Dives are guided by our PADI divemasters or instructors who all have intimate knowledge of the sites and the creatures that live there. 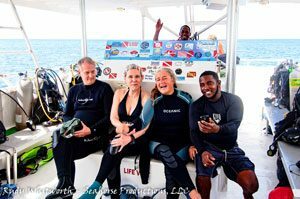 Whatever your experience and ability, scuba diving with Dive Dominica is professionally organized, friendly, and geared to maximize your safety and fun.